I had some old bananas I needed to use up, so I made this the other night while watching my guilty pleasure, the Bachelor. Recipe from Cooking Light. I even remembered to take a picture! YUM. Bonus: In addition to tasting good, it made the house smell amazing for about 24 hours. Lightly spoon flour into dry measuring cups and level with a knife. Combine the flour, baking soda and salt, stirring with a whisk. Place sugar and butter in a large bowl; beat with a mixer at medium speed until well blended. Add eggs, one at a time, beating well after each addition. Add banana, peel and juice; beat until blended. Add flour mixture; beat at low speed until just moist. Stir in walnuts. 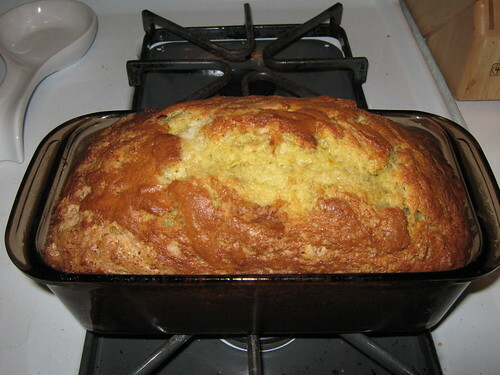 Spoon into an 8 1/2 by 4 1/2-inch loaf pan coated with cooking spray. Bake at 350 for one hour and 5 minutes or until a wooden pick inserted in center comes out clean. Cool 10 minutes in pan on a wire rack; remove from pan. Cool completely on wire rack.